Prior to the advent of earth-orbiting satellites, very long range communications like between continents was dependent on the state of the various ionosphere levels. There is never a completely predictable "open" channel from point A to point B. A satellite repeater, however, while not always in a position to be within view of both points, at least is predictable based on a published ephemeris of times and positions. The first OSCAR (Orbiting Satellite Carrying Amateur Radio), now governed by AMSAT, was launched in December of 1961. This 1973 article in Popular Electronics mentions OSCAR 6, which was launched in October 1972. Fig. 1 - Diagram of basic repeater operation. Control system determines if it is for general or private use. Fig. 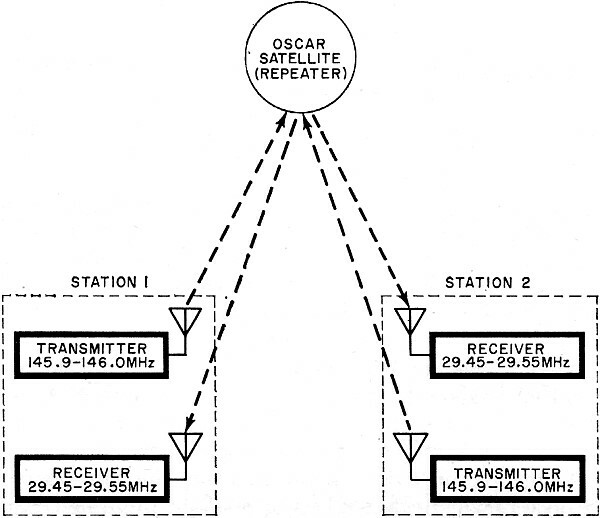 2 - The Oscar earth satellite repeater receives 2-meter transmission, transmits on 10 meters. Fig. 3 - Basic auto-patch communication system for the 2-meter amateur band. A repeater is a modified transceiver that accepts an input r−f signal at one frequency and retransmits it at another r−f frequency. Usually mounted at points of excellent area coverage (on top of hills, towers, etc. ), a number of amateur 2-meter band repeaters have greatly expanded the usage of this VHF band. One example of how far repeaters have advanced is the Oscar 6 amateur radio satellite now orbiting the earth. 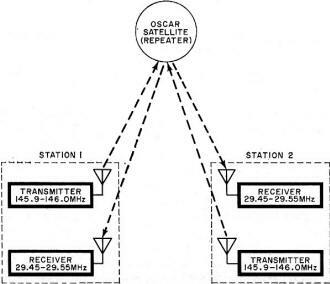 This really "far out" repeater has enabled 2-meter hams (144-148 MHz) to make clean contacts almost anywhere in the world where Oscar can be "seen" simultaneously by both parties. Several contacts have been made recently between 2-meter hams in the U.S. and Japan. Contacts of over 1000 miles are not a rarity using this repeater. The concept of the repeater has been in use for some time by commercial communication companies, as well as by the ham fraternity. With repeaters, hams going cross-country can greatly extend their operating range; and even hand-held portables can be heard as far away as a more powerful base station. 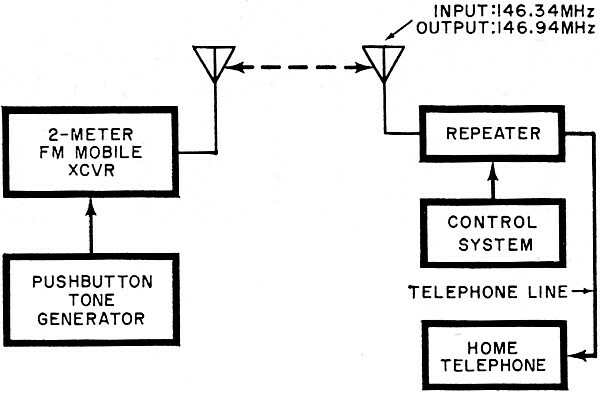 A block diagram of a typical repeater is shown in Fig. 1. In this case, the repeater transmitter operates at 146.34 MHz while the receiver is tuned to 146.94 MHz. 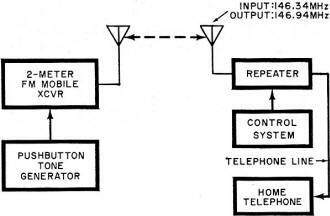 Entry into the repeater is determined by a control circuit which may be as simple as a carrier-operated relay that turns on the repeater when a received carrier (within the receiver's bandpass) exceeds some predetermined level. On the other hand, the control circuit may require a special series of audio tones (known only to club members) or it may have to be turned on remotely by one of the club members. Why only club members? Because a relatively sophisticated repeater may represent quite an investment of time and money on the part of the amateur radio club which operates it. 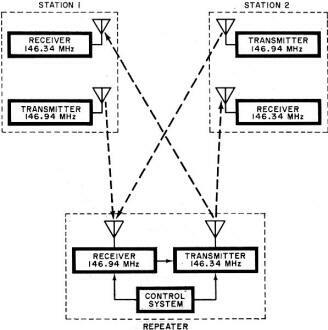 The two stations involved must have transmitters operating at the receiving frequency of the repeater and must be able to receive at the transmitted frequency of the repeater. Although the 2-meter frequencies previously mentioned are commonly used, other frequencies are possible - usually separated by about 600 kHz. In the case of the Oscar satellite, a different approach is used (Fig. 2). The input frequencies to the satellite repeater are from 145.9 to 146 MHz, and it transmits on the 10-meter band from 29.45 to 29.55 MHz. Potential Is Great. The potential use for space repeater systems is enormous. Hams have been experimenting for many years with moon bounce - using the moon as a passive reflector or mirror. However, transmission losses are very high due to the passive nature of the moon, and the radio waves are highly attenuated as they travel the long distance through space. With Oscar however, signal reinforcement produces a far better signal-to-noise ratio and greatly improves the performance. In fact, establishing contacts across the Atlantic or the Pacific is quite common - feats that were considered impossible only a few short years ago. Another exciting aspect of amateur 2-meter FM and repeaters, is the use of the "auto patch" (Fig. 3). The mobile ham simply "calls" auto patch and operates a pushbutton tone generator (such as used in home phones) to get a land-line connection. In this case, the connection between the mobile and the remote phone is a radio link. This service is a great asset when traveling in remote areas or in the event of an emergency. Repeater Locations. Each section of the country has its own repeater locations, determined by the club members who operate them. Local 2-meter hams are aware of these locations. While 2-meter FM repeater operation is very popular, repeaters have also been used on the 6-meter ham band; and there seems to be great potential for use in the uhf bands. 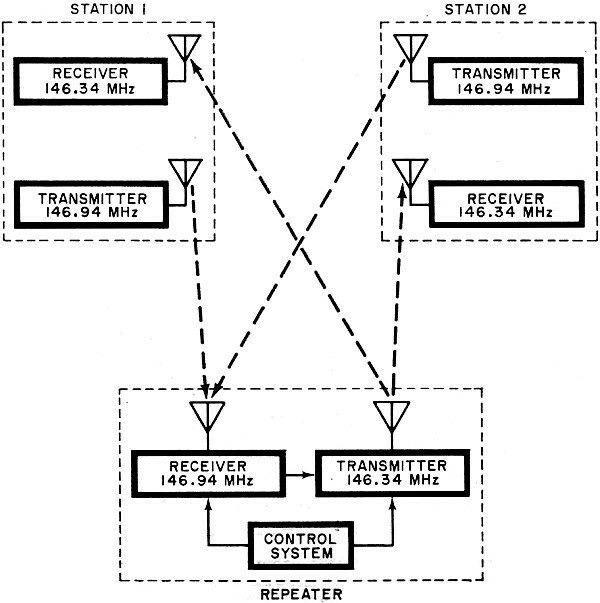 An excellent treatment of repeaters can be found in the ARRL publication The Radio Amateur's VHF Manual. It is $2.50 at many electronic distributors - especially those that handle ham gear. 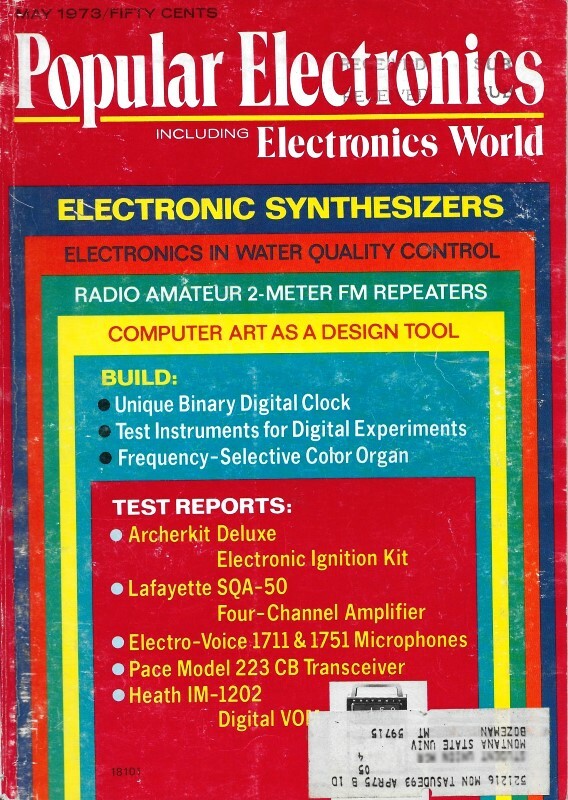 Frequencies for virtually all amateur operation in the 2-meter band and standard direct and repeater frequencies are given in QST magazine for May 1972.